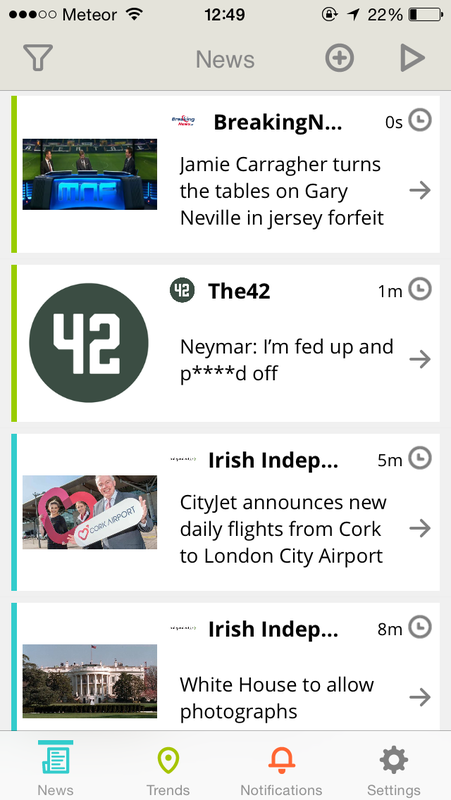 Fews is a news aggregator app for iOS, Apple Watch and Android that features local and international news from 28 countries, in their native languages. Released this week, it’s free to download and works by integrating over 1,000 RSS feeds. Content on Fews is divided into five main categories: general news, lifestyle, sports, economy and tech. Countries covered by the app include Argentina, Australia, Austria, Belgium, Brazil, Canada, Chile, Denmark, France, Germany, Greece, Ireland, Italy, Japan, Mexico, Netherlands, New Zealand, Norway, Peru, Portugal, Russia, South Africa, Spain, Sweden, Switzerland, Turkey, United Kingdom and United States. While I’m a big fan of Flipboard and skeptical of anything taking over that spot on my home screen, I was intrigued to give Fews a go. Signing up is straightforward; you don’t have to connect with your Facebook or Twitter account, so that’s a plus in my book. What struck me first was the design of the main view – a river-style news feed. I had expected to see modular tiles all over the page, but instead, I was pleasantly surprised by the clean, simple scrollable page I was presented with. One of my favorite things about using Fews has been the Trends feature. 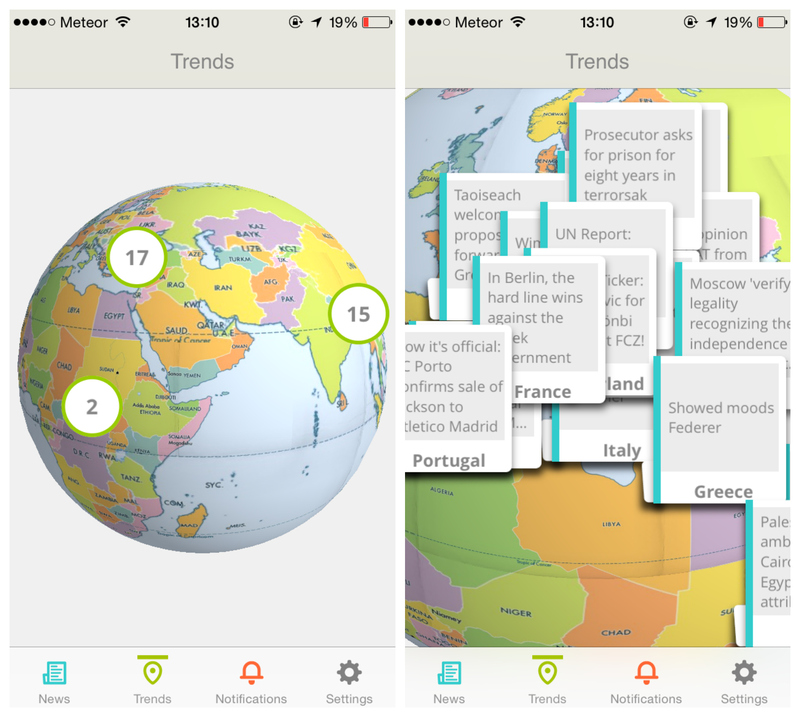 It’s an interactive globe that lets you discover trending stories and breaking news from different countries. I found it particularly interesting to see the difference in what’s the most popular news story in various countries, despite there being topical international news like Greece’s financial crisis in the headlines as well. 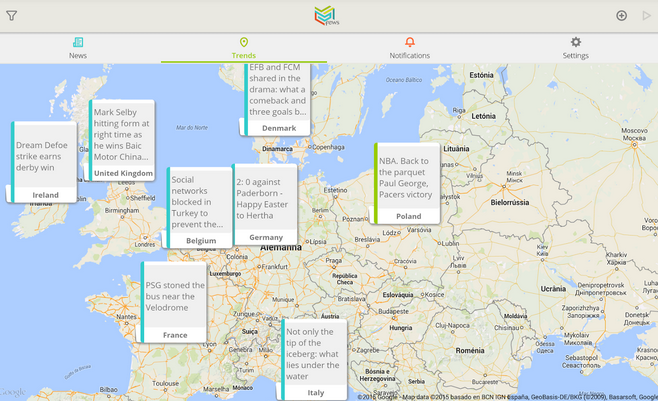 For people who live away from their native countries, it’s a very handy tool for keeping track of the news where you currently are and at home, in one place. Back on the main news feed, stories are clearly highlighted in individual colored tiles distinguishing between the five aforementioned categories. There’s a filter option in the top left corner of the screen, so you can un-tick any section that doesn’t appeal to you and tighten up your newsfeed. In the top right corner, there’s a plus icon that allows you to manually select countries you would like to keep up to date with and individually choose what RSS feed sources to integrate. One negative thing is that you can’t add your own RSS feed yet, but perhaps that will be possible with a future update. 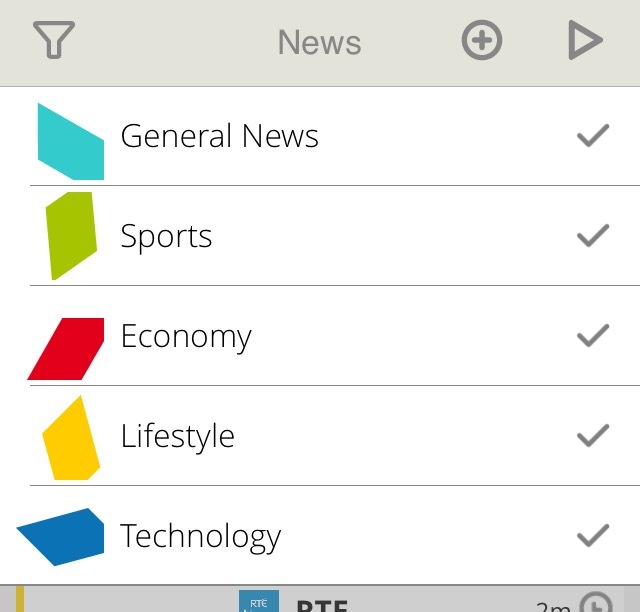 Fews offers a handy ‘text to voice’ feature you can use to have the news read out to you. It’s a good one for when you’re driving, or I found it particularly useful for when I was cooking. I just chose the story I wanted and hit play. 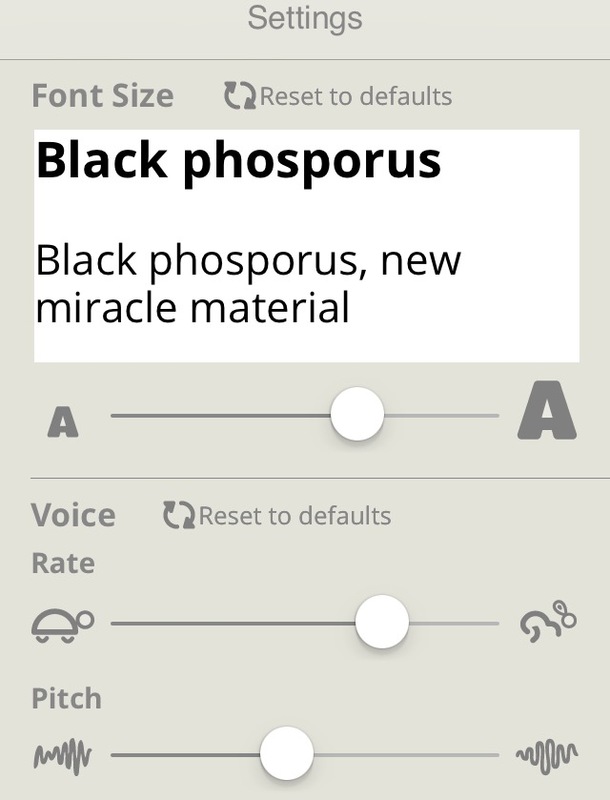 You can adjust the voice rate and pitch in the settings menu so it can be as un-human or human as you like. It’s also possible to alter the text for stories on the app in the settings menu. Adjusting the size works better than zooming in because you don’t end up having to scroll horizontally to see the end of each sentence, it auto-fits to the screen no matter what size you choose. To add to the customization, there’s an option to create a list of keywords for the topics that interest you, and when a relevant story appears, you’ll receive a notification. Overall, I was surprised by how much I liked Fews. I’ve already become accustomed to checking it regularly in the short time I’ve been using the app. The level of customization is what appeals to me the most, and for the countries I follow, it has a strong list of sources so I’m not missing out on anything. I obviously can’t vouch for all of the countries on the app, but the selection of sources shown seems decent for the majority of them. It’s still early days, so I haven’t deleted my Flipboard app just yet, but Fews is a serious contender. If you’re looking for a good all-round source for global news, it’s definitely worth checking out.